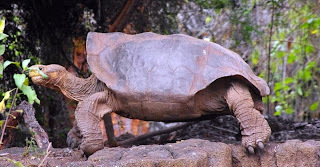 Thank you for visiting my Galapagos blog. - See posts from individual days and all landings below. - you can read the Quito pre- and post-cruise tour at this link. At our 7-night Galapagos island B Cruise (Inner loop itinerary) departing from Baltra November 10. 2013. 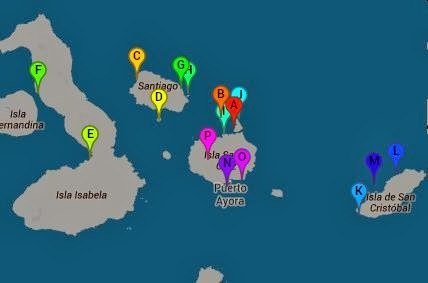 Link to video from each landing: we did Circumnavigate Daphne Minor & Major; and visited Puerto Egas (Santiago); Rabida Island; Elizabeth Bay (Isabela); Tagus Cove (Isabela); Sullivan Bay (Santiago); Bartolome Island; Bachas Beach (Santa Cruz); North Seymour Island; Puerto Baquerizo Moreno (San Cristobal); CerroBrujo (San Cristobal); Kicker Rock (San Cristobal); Puerto Ayora with Charles Darwin Station and Highlands (Santa Cruz); and back at Baltra November 17, 2013. Click on the map to the left and open the map with links to videos from the different places we visited on the trip. We booked our tour direct with Celebrity Cruises at celebritycruises.com. Flight to Quito was booked direct at united.com. Below you will find blogs with reviews from each of the landings on itinerary B (Inner Loop itinerary) . 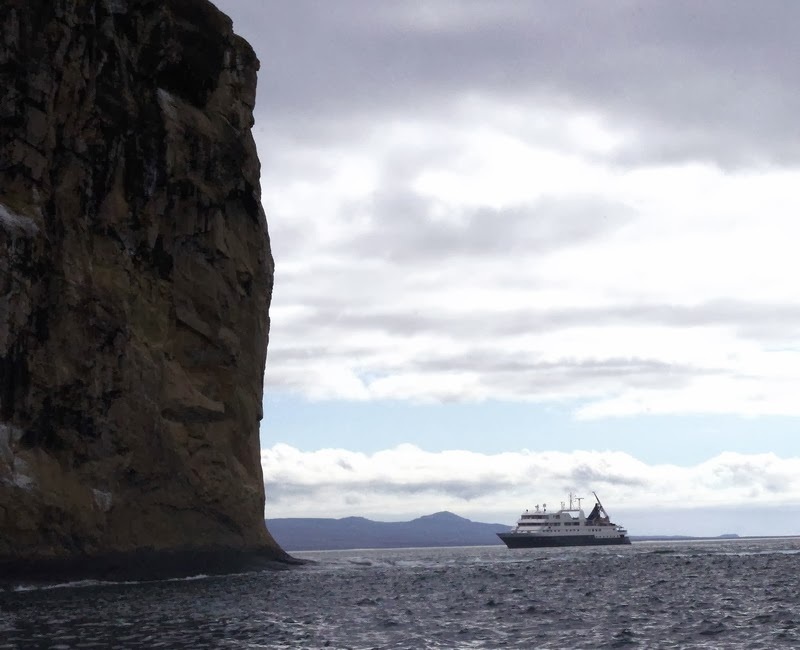 We found, that the best way to see the Galapagos Islands is by ship. By ship it is possible to visit several different places, both the wester and the eastern islands, in order to experience the different nature and the many special animals on the Galapagos Islands. 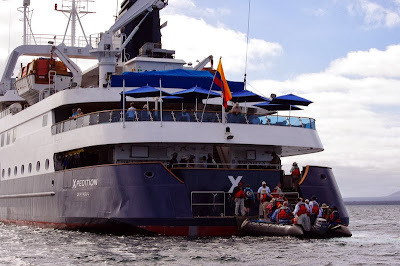 After review of the different offerings, we did select a cruise with Celebrity Xpedition. Virtuel video tour from Xpedition. We chose Celebrity Xpedition a larger ship with capacity for 96 passengers because this ship is absolutely in the best category in terms of quality of cabins, public spaces, meals on board and guides in the Galapagos Islands. Although there are 96 people, it was like a big family, and each group visiting the islands was not more than 16 people. At Xpedition, there are several different offerings at each destination - Long and short walks or panga ride only. 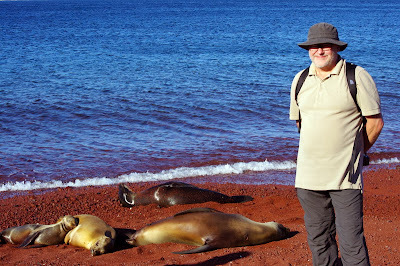 Also the guides on Xpedition are among the best in the Galapagos. 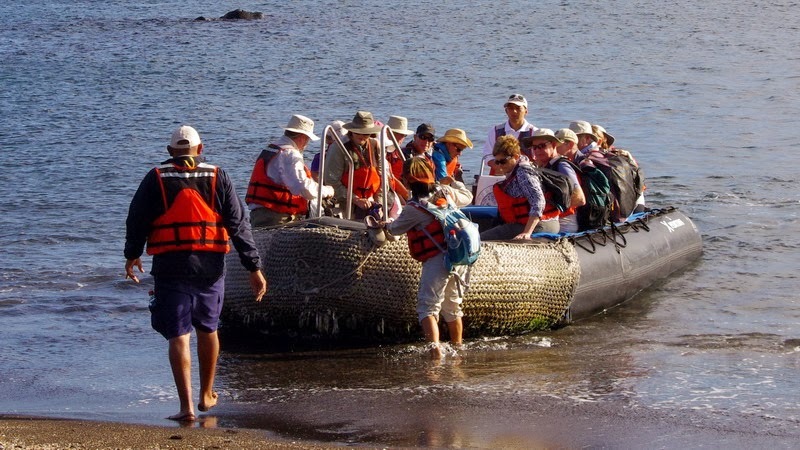 Unlike other Celebrity cruises the Xpedition is an all inclusive tour. 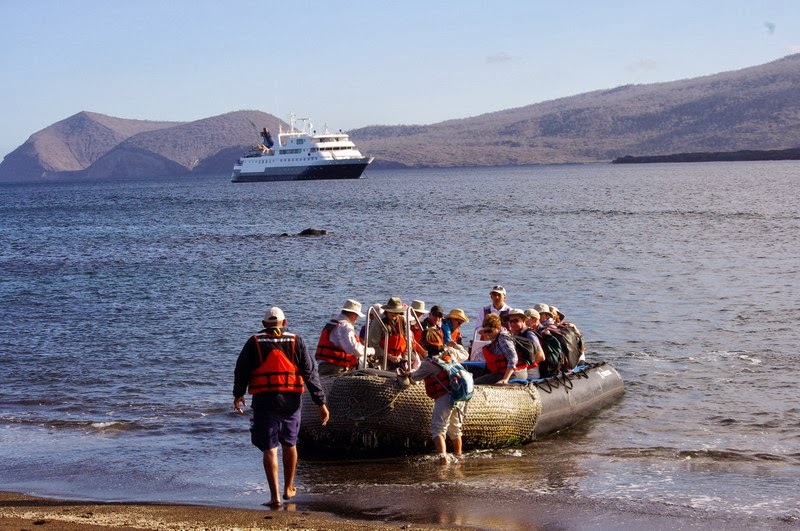 For the 7-night Galapagos cruise we have booked the 10-night cruise tour with two nights at J.W.Marriott Hotel in Quito before and one night after the cruise. inclusive breakfast at fhe the hotel and dinner at the Carmine Restaurant Saturday evening before the cruise, as well as and dinner at the Marriott Sunday evening after the cruise. Also included a Quito city tour and a visit to the 'Mitad del Mundo' monument as well as a local Quito market. This 10-day tour also include the Xpedition charter flight from Quito to Galapagos. Luggage was brought direct from the hotel to our cabin, both ways. There are two Xpedition itineraries - The Galapagos island A Cruise and the B Cruise. There is no big differences between the Outer loop itinerary (A) and Inner loop itinerary (B -itinerary) on A you will see nesting Albatros while B will have nesting Frigate birds. 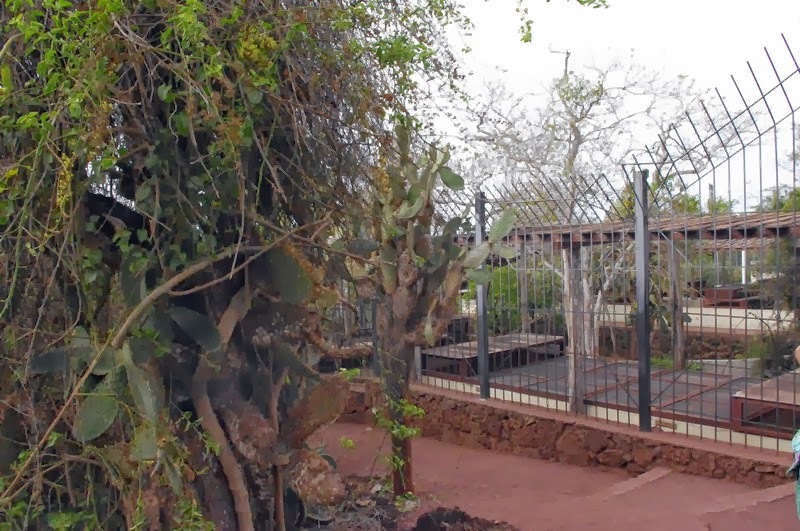 The major reason for the two itineraries, is to allow the animals some rest between the visits. See reviews in the posts below including links to videos. We had to put the suitcases outside the cabin door Saturday evening, and then we didn't see them, until we arrived at the JW Marriott hotel in Quito Sunday after noon. The suit cases were delivered to our room at the hotel just after arrival. We had to be out of our cabin at 8AM. Went down to Darwins restaurant for breakfast, and at 9am we got our boarding pass for the Celebrity Charter flight to Quito. Then the pangas were ready to transport us at our last Galapagos panga ride into the Baltra pier. From the pier we continued by by bus the short distance to the airport. Went through security and waited an hour, before for the charter plane departed for Quito. We did have a nice lunch on the 'Celebrity Xpedition' plane on our Balta to Quito flight. At about 3PM we landed in Quito where we went straight to the buses, that brought us to hotel JW Marriott, a trip of approximately 1 hour. In the evening there was a dinner for all Celebrity guests at the Marriott hotel. After the Galapagos cruise we stayed 5 days in Quito, from where we have planned some excursions in Ecuador. At the end we did have a 24 hour flight from Quito via Houston, Texas, continued via New York to Copenhagen. and from the Fish Market. After breakfast we went into Puerto Ayora is the largest town in the Galapagos. Here we first visited the Darwin Centre (see other blog) and then we went for a walk in the city - the most interesting seeing was the local fish market, where the fishermen just had landed the catch of the day and was cleaning the fish - sea lions, frigate birds and pelicans were fighting for the remains, and fishermen had a hard time keeping sea lions and the large birds away from the fish - a fun experience - late morning we went back to the ship for lunch. Santa Cruz is named after the Holy Cross, its English name (Indefatigable) was given after a British vessel (HMS Indefatigable). 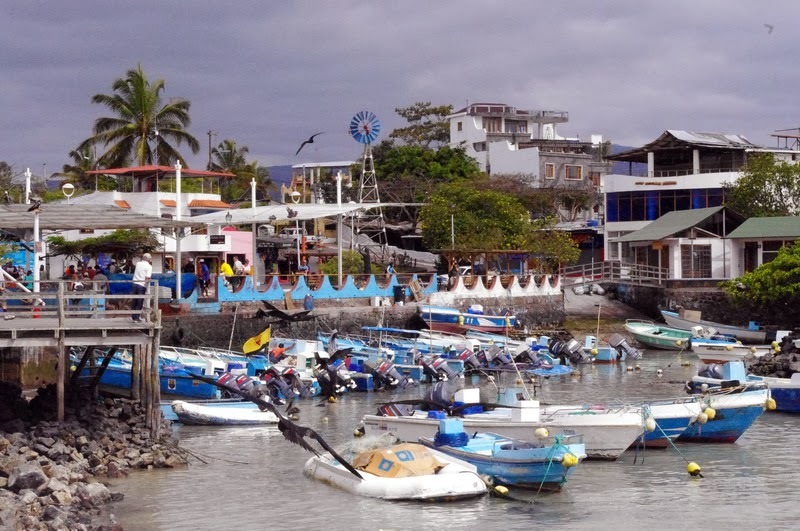 Santa Cruz hosts the largest human population in the archipelago at the town of Puerto Ayora, a port city located along Academy Bay on Santa Cruz Island, with more than 12,000 inhabitants, the largest city in the Galapagos. 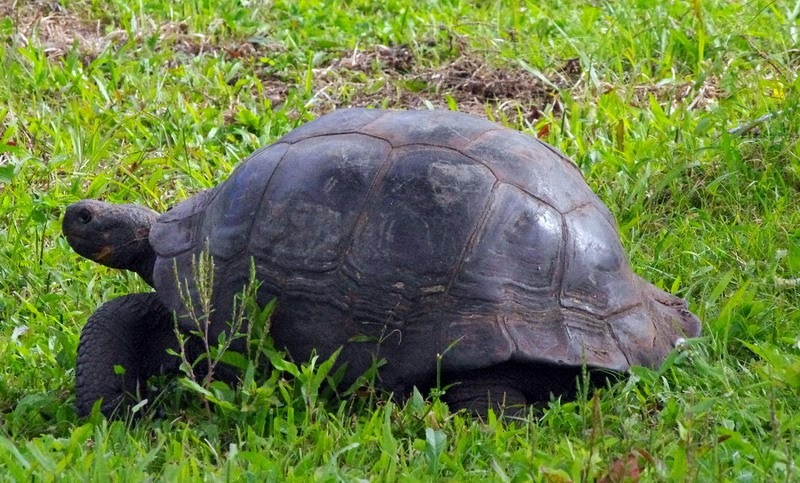 The city is home to the National Park Tortoise Breeding Center and the Charles Darwin Research Station and a center of tourism in the islands. 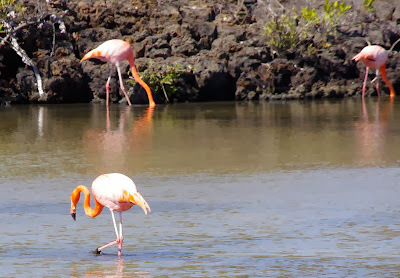 There are many trips from Puerto Ayora to the different islands in the Galapagos. There are also cities at the Galapagos - the town of Puerto Baquerizo Moreno is the administrative capital of the islands, and with its 5,600 inhabitants is the second largest town in the Galapagos - the town is primarily a fishing village. After breakfast we sailed to the waterfront in the panga's. First we went on a short tour of the local 'Interpretation Center' where there was an exhibition about the history of the Galapagos. 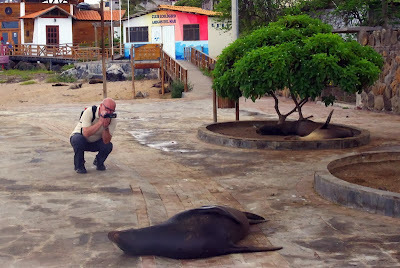 Then we walked around town and looked at the sea lions lying on the street and benches along the waterfront. At about 11AM we went back to the ship for lunch. 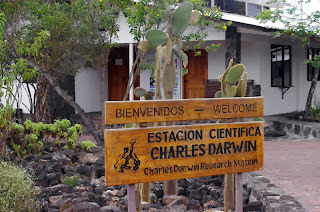 San Cristobal is the easternmost island in the Galapagos archipelago, and one of the oldest geologically. It bears the name of the Patron Saint of seafarers, 'St. Christopher'. Its English name was given after William Pitt, 1st Earl of Chatham. It has an area of 558 square kilometres (215 square miles) and its highest point rises to 730 metres (2,395 feet). The town of Puerto Baquerizo Moreno is the provincial capital of the Galapagos and the second largest settlement on the islands and home to one of the island's two major airports. It originated as a penal colony more than a hundred years ago. Now a sleepy town overlooking the harbor is known for its relaxed attitude. The beaches close to the city is one of the few places where visitors are allowed to camp on the islands, National Park Information site is located just outside the city, is pleased to provide information. 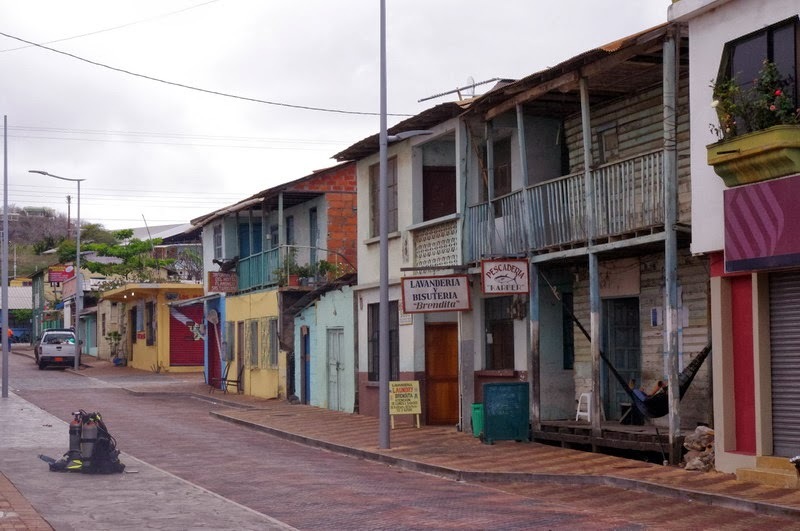 There are a number of hotels and restaurants available for those interested in staying a few extra days in the area to explore some of the local locations. After lunch we did approach North Seymour with a dry landing on the steep rocks. 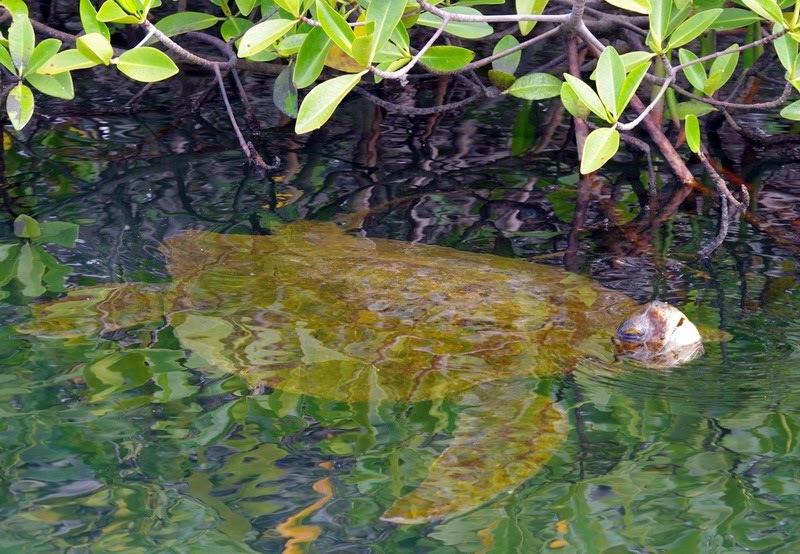 The island is teeming with life. North Seymour has a visitor trail approximately 2 kilometres in length crossing the inland of the island and exploring the rocky coast. 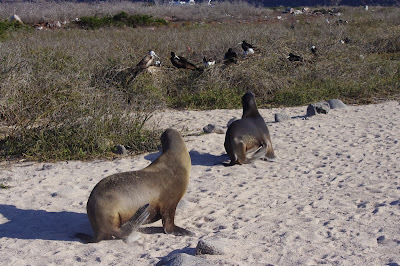 During our visiting we had to give way to passing sea lions and land iguana. The whole island is covered with low, bushy vegetation. 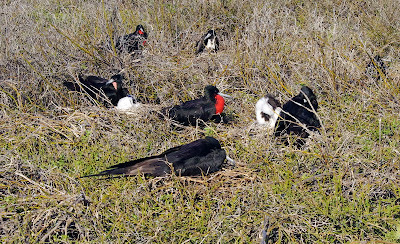 Magnificent frigatebirds perch in low bushes, near the boobies, while watching over their large chicks. The frigates are huge, dark acrobats with a 2.5m (90-inch) wingspan. 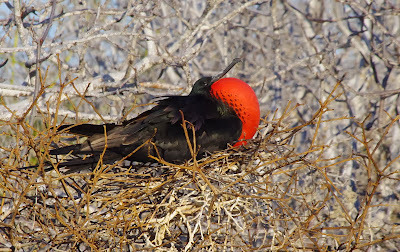 Male frigates can puff up their scarlet throat sacks to resemble a giant red balloon. Boobies and frigates have an interesting relationship. Booby birds are excellent hunters and fish in flocks. The frigates by comparison are pirates, they dive bomb the boobies to force them to drop their prey. Then the acrobatic frigate bird swoops down and picks up the food before it hits the water. The island is named after an English nobleman, Lord Hugh Seymour. It has an area of 1.9 km² (0.7 square miles) and a maximum altitude of 28 metres (92 feet). 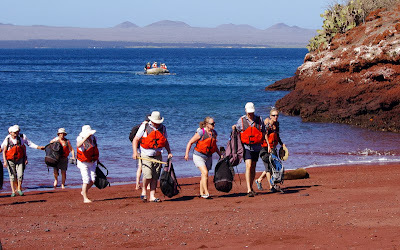 Bartolomé Island is one of the most spectacular of settings in the Galapagos. After a dry landing we did climb the volcanic cone (board walk and 380 stairs) and from the top there was a great views of the other islands. 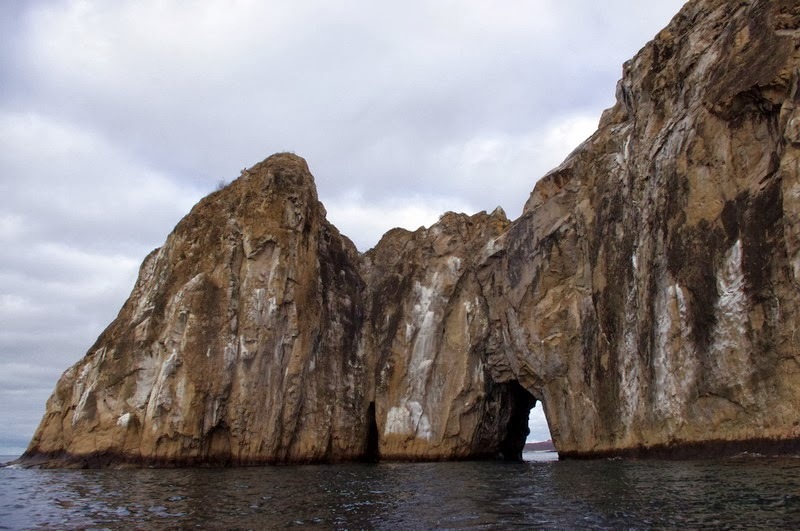 Bartolomé is famous for its Pinnacle Rock, which is the distinctive characteristic of this island, and the most representative landmark of the Galápagos. Optionally you could also swim and snorkel around Pinnacle Rock; the underwater world there is impressive. 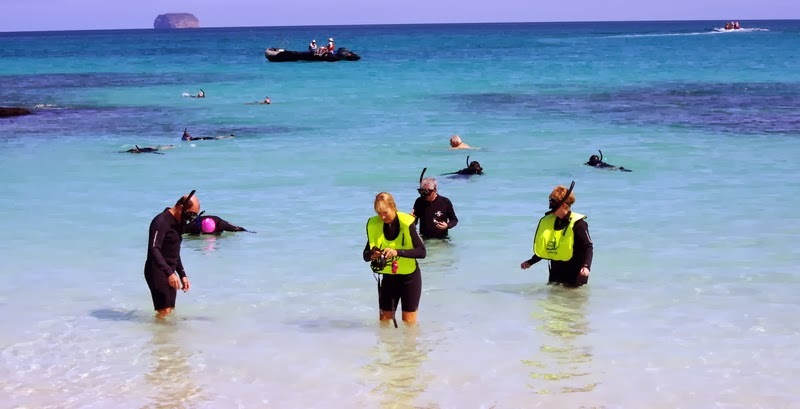 You can snorkel with the penguins, marine turtles, white-tipped reef sharks, and other tropical fish. Bartolomé Island is a volcanic islet in the Galápagos Islands group. 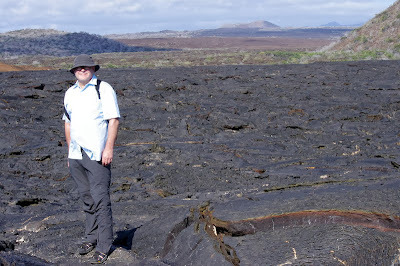 It is a volcanic islet just off the east coast of Santiago Island. It is one of the "younger" islands in the Galápagos archipelago. This island, and Sulivan Bay on Santiago island, are named after naturalist and lifelong friend of Charles Darwin, Sir Bartholomew James Sulivan, who was a Lieutenant aboard HMS Beagle. 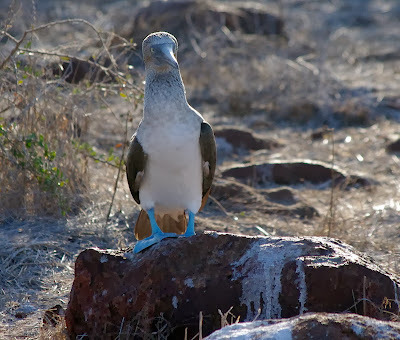 The Blue-footed Booby (Sula nebouxii) is a marine bird in the family Sulidae, which includes ten species of long-winged seabirds. 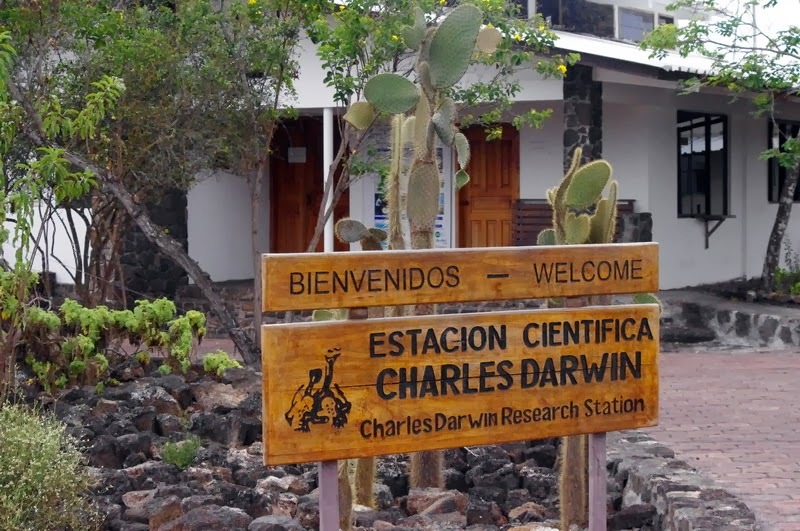 First studied extensively by Charles Darwin at the Galapagos. It belongs to the genus Sula, which comprises six species of boobies. 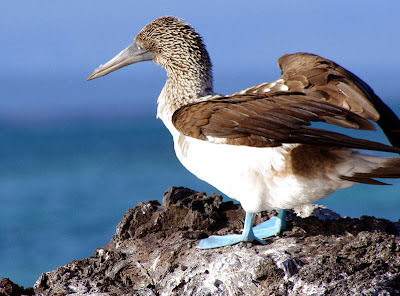 It is easily recognizable by its distinctive bright blue feet, which is a sexually selected trait. Males display their feet in an elaborate mating ritual by lifting their feet up and down while strutting before the female. The female is slightly larger than the male and can measure up to 90 cm (36 in) long with a wingspan of up to 1.5 m (4.9 ft). Magnificent Frigatebirds (Fregata magnificens) are a family, Fregatidae, of seabirds. There are five species in the single genus Fregata. They are also sometimes called Man of War birds or Pirate birds. Since they are related to the pelicans, the term "frigate pelican" is also a name applied to them. They have long wings, tails, and bills and the males have a red gular pouch that is inflated during the breeding season to attract a mate. Frigatebirds are pelagic piscivores that obtain most of their food on the wing. A small amount of their diet is obtained by robbing other seabirds, a behaviour that has given the family its name, and by snatching seabird chicks. 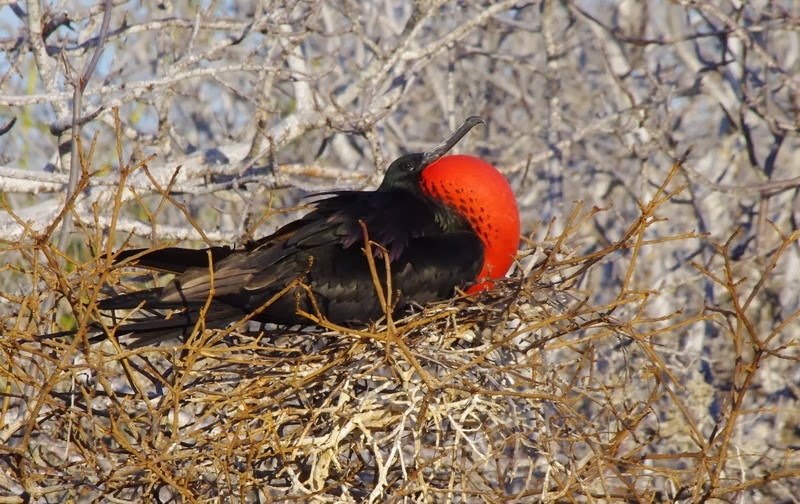 Frigatebirds are seasonally monogamous, and nest colonially. A rough nest is constructed in low trees or on the ground on remote islands. A single egg is laid each breeding season. The duration of parental care in frigatebirds is the longest of any bird. After hunting the whales (see other blog) we did sail along the coast where we saw Galapagos Penguins, Blue footed Boobies, nesting Pelicans and the Flightless Cormorants. After a dry landing on the rocks we did a strenous hike up the side of a volcanic tuff cone to the wondrous view of Darwin's Lake, a perfectly round saltwater crater. Resting Sea Lions, Finches and Mockingbirds. I was surprised by the more recent graffiti. Unfortunately - many of the old ships and even some more recent ships have left their marks with maritime graffiti along the walls. The graffiti at the walls is banned today - but the historical graffiti remains a tourist attraction, but even some of the historical artifacts are not always pleasant to watch. The Galapagos Penguin (Spheniscus mendiculus) is a penguin endemic to the Galapagos Islands. It is the only penguin that lives north of the equator in the wild. It can survive due to the cool temperatures resulting from the Humboldt Current and cool waters from great depths brought up by the Cromwell Current. The Galapagos Penguin is one of the banded penguins, the other species of which live mostly on the coasts of Africa and mainland South America. 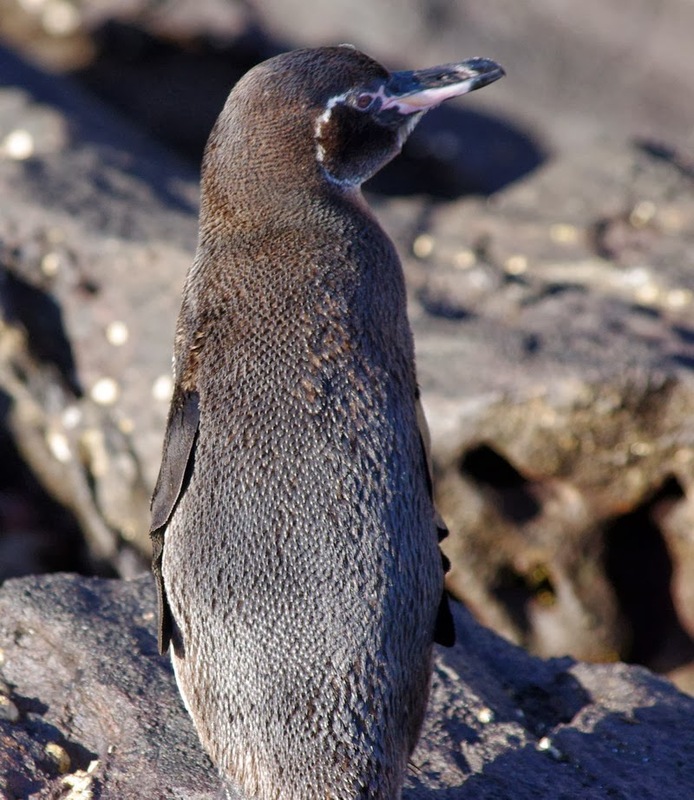 The average Galapagos Penguin is 49 centimetres (19 in) long and 2.5 kilograms (5.5 lb) in weight. It is the second smallest species of penguin. They have a black head with a white border running from behind the eye, around the black ear-coverts and chin, to join on the throat. The Galapagos Penguin occurs primarily on Fernandina Island and the west coast of Isabela Island, but small populations are scattered on other islands in the Galapagos archipelago. Flightless cormorants (Phalacrocorax harrisi), also known as the Galapagos Cormorant, is a cormorant native to the Galapagos Islands, and an example of the highly unusual fauna there. It is unique in that it is the only cormorant that has lost the ability to fly. 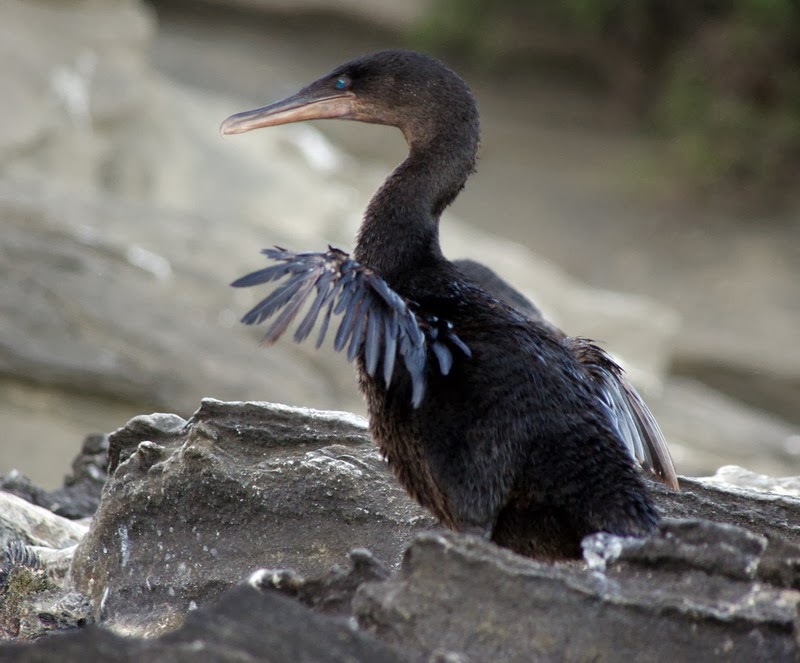 Like all cormorants, this bird has webbed feet and powerful legs that propel it through ocean waters as it seeks its prey of fish, eels, small octopuses, and other small creatures. They feed near the sea floor and no more than 100m offshore. The Flightless Cormorant is the largest extant member of its family, 89–100 cm (35–40 in) in length and weighing 2.5–5.0 kg (5.5-11 lbs), and its wings are about one-third the size that would be required for a bird of its proportions to fly. The keel on the breastbone, where birds attach the large muscles needed for flight, is also greatly reduced. Tagus Cove, named for the British naval vessel that moored here in 1814, was used historically as an anchorage for pirates and whalers. The coves quiet waters make for an ideal panga ride beneath its sheltered cliffs, where blue-fotted boobies, brown noddies, pelicans and noddy terns make their nests, and flightless cormorants and penguins inhabit the lava ledges. From the shore, a wooden stairway rises to the dusty trail passing through the Palo Santo Forests to reach the perfectly round saltwater crater, Darwin Lake. After lunch we headed towards Targus Cove, at the north-west coast of Isabela - first part of the excursion was a panga ride along the shore. 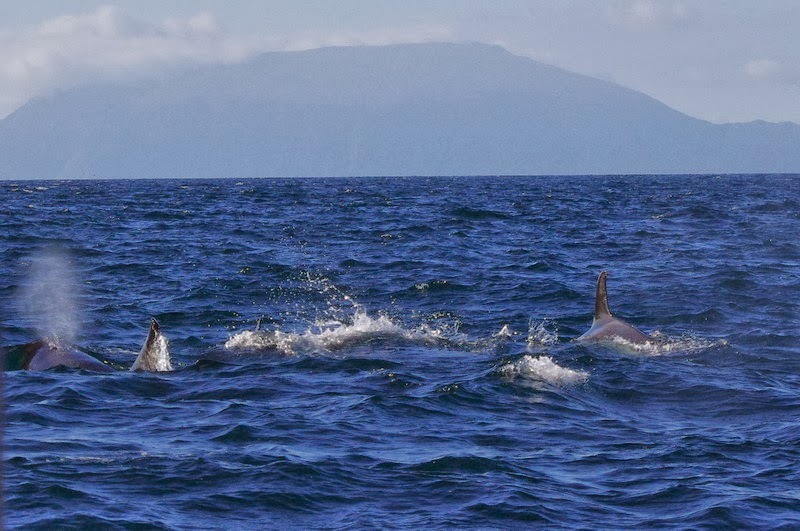 Suddenly we saw a small group of Killer Whales and the panga's did try to follow the whales. Whales are commonn in the Bolivar Channel between Isabela and Espinoza. The killer whale (Orcinus orca), or the orca whale, is a toothed whale belonging to the oceanic dolphin family. Killer whales are found in all oceans, from the frigid Arctic and Antarctic regions to tropical seas. Killer whales as a species have a diverse diet, although individual populations often specialize in particular types of prey. Some feed exclusively on fish, while others hunt marine mammals such as sea lions, seals, walruses, and even large whales. 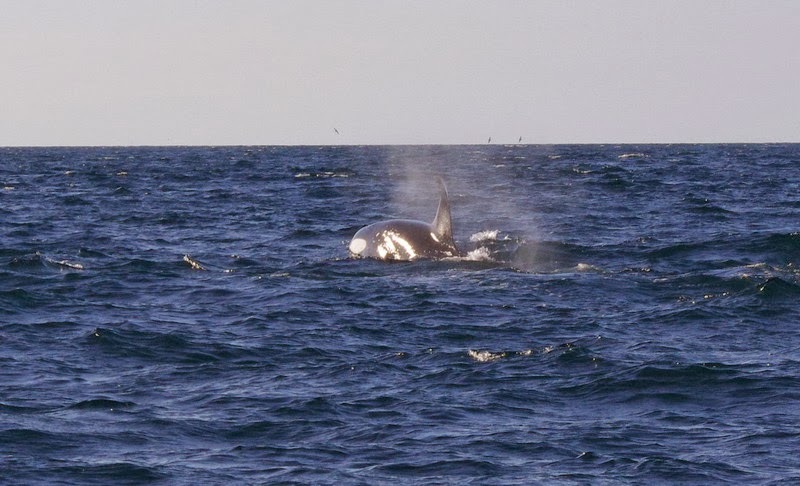 Killer whales are regarded as apex predators, lacking natural predators. Elizabeth Bay is a site visit where it is not allowed to land, here is exclusively panga rides observing wildlife. 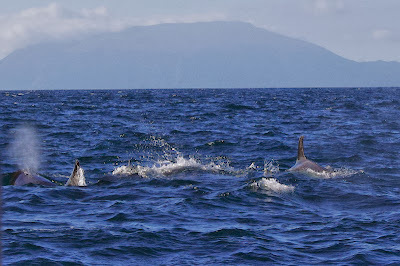 From the panga (picture) we saw Brown Pelicans, Blue Footed Boobies (picture) and Galapagos Penguins, as well as Flightless Cormorants, Sea Turtles (picture) and Sea Lions. Elizabeth Bay is located in the most narrowest site of Isabela Island, the Isthmus of Perry on the inside where there is a leak that has formed a small bay within the bay, very calm and protected waters and surrounded by mangle, which makes it an appropriate place for sea turtles (picture). 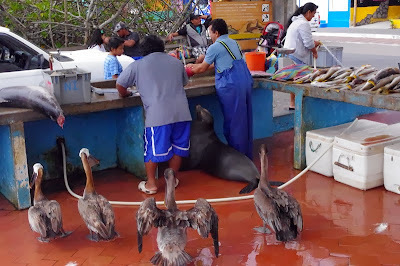 In this place, food and shelter as many marine species including rays, sharks, sea turtles, penguins, pelicans, boobies, sea lions and fish in general. Located on the east coast of Isabela, the largest island of the archipelago, with 4588 km2 and a height of 1710 m in the Volcano Wolf, on elements which also crosses the imaginary line of Ecuador. 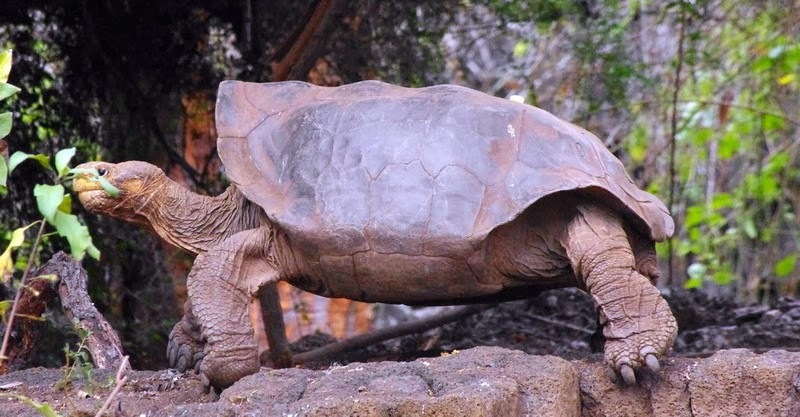 This island has six volcanoes, each volcano is active and a subspecies of tortoises. Elizabeth Bay is formed by the union of the volcanoes Sierra Negra and Alcedo Volcano, the second largest and most active volcano in the world. 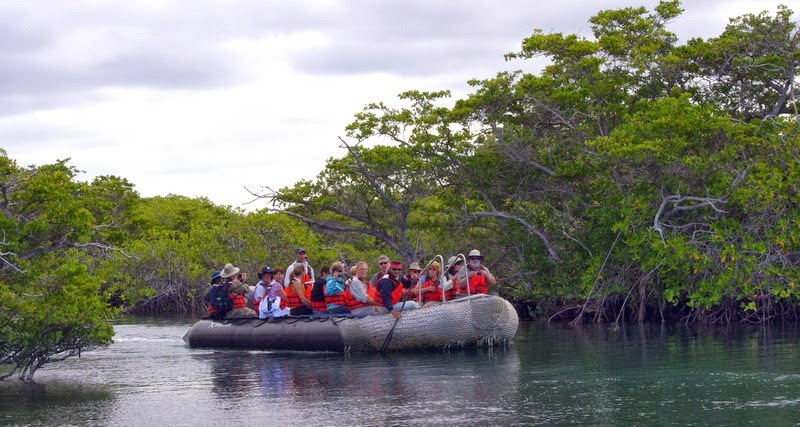 Located on the east coast of Isabela Island in the Galapagos Archipelago, has a very high and colorful mangrove, which contrasts with the lava. 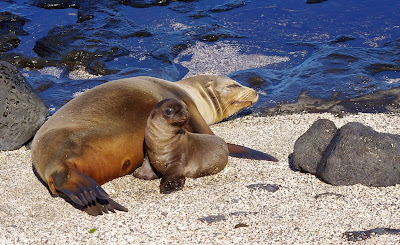 In Elizabeth Bay can observe sea lions, turtles, and around the islets of the bay, are flightless cormorants, penguins, marine iguanas, blue footed boobies, masked boobies and gulls. The island Isabela was named in honour of Queen Isabela of Spain who sponsored the voyage of Columbus. With an area of 4,640 square kilometres (1,792 square miles), it is the largest island of the Galápagos and occupies about 60% of all the land area of Galápagos. 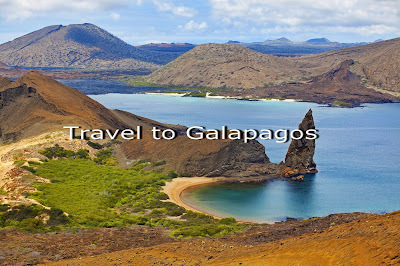 Its highest point is Wolf Volcano with an altitude of 1,707 metres (5,600 feet) the highest peak on all of Galápagos. The Equator passes directly through the island. After lunch we sailed towards Rabida Island. The landscapes of the island are visually stunning. It's the top of an old volcanic cone bathered in Crimson. The rocks and sand are hued brilliant red and sit amid coves of clear blue waters. After a wet landing we walked on a rocky and steep trail for about one mile. Rabida has a salt water lagoon, where there used to be flamingos, but now the lagoon is occupied by sea lions and the flamingoes have dissapeard. 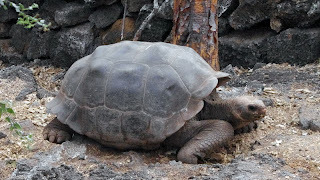 we also saw Darwin's finches, Lava Lizards, Galapagos Hawks, Ducks, White-cheeked Pintail, Sea Lions, and Brown Pelicans. Rabida Island has also been know as Jervis Island named in honor of the18th century British admiral John Jervis. In Ecuador it is official known as Isla Rabida. It bears the name of the convent of Rabida where Columbus left his son during his voyage to the Americas. Rabida Island has an area of 4.9 square kilometres (1.9 square miles) and a maximum altitude of 367 metres (1,204 feet). Located south of Santiago, Rabida is one of the most volcanically varied islands in the chain. Geologically consisting of eroded hills and lava emitted from spatter cones that have resulted in islands striking colours. White-Cheeked Pintail Ducks live in a salt-water lagoon close to the beach. On the cliffs Blue Footed and Nazca booby birds build their nests. 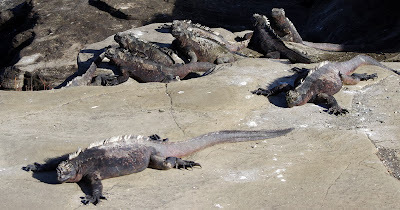 Marine Iguanas and Sea Lions are often seen resting in the shade of the caves nearby. Behind the beach is the salt brush home where the Brown Pelicans make their nests. 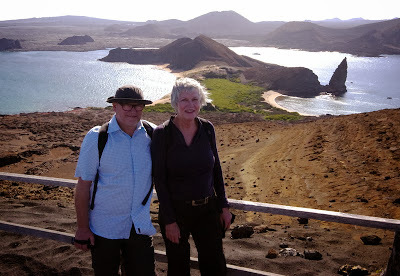 After breakfast in Darwins restaurant we were ready for the Long Walk and optional snorkel at Puerto Egas. We did a wet landing south of James Bay at the west side of Santiago. 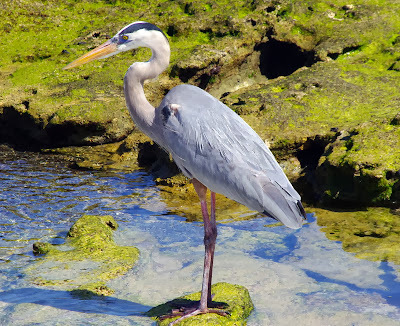 There is a long, lava shoreline where eroded rock formations house an excellent variety of wildlife. Marine iguanas bask in the sun. The tide pools contain many Sally Lightfoot crabs, which attract other types of hunters. 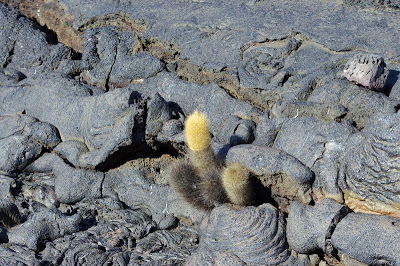 At the beach and rocks there were Marine Iguana, Sea Lions and Galapagos Fur Seals. We also saw Blue footed booby, Lava Heron, Oystercatcher and Warblers and inland the Finches and the Galapagos Hawk. 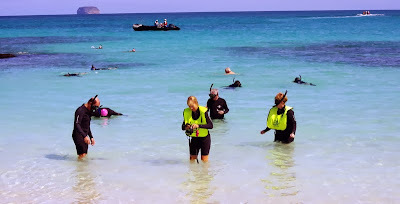 The optional snorkelling allowed for swimming with the sealsand a large number and variety of fish. 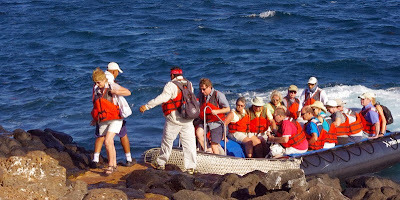 Puerto Egas and Southern James Bay is located northwest of Santiago Island, fascinating place to visit because they had a great volcanic activity in the past. Puerto Egas is one of the most popular sites in the Galapagos Archipelago. It has a beautiful black sand beach where you can see the ruins consist of a salt company and its many inhabitants as the sea lions, chameleons, lizards and lava herons. Puerto Egas was formerly used for salt mining, which took in large quantities. 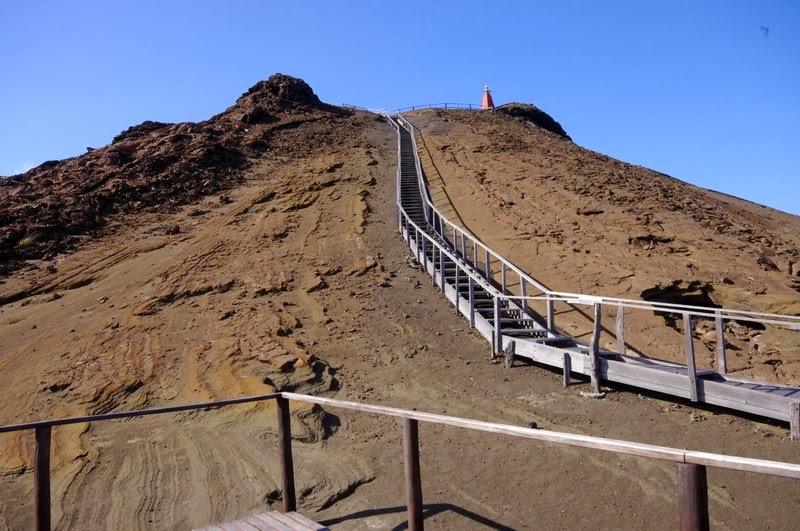 At South Beach is located Sugarloaf Volcano, which has deposits of volcanic tuff, the same that have favored the formation of black sand beach. The crater is a saltwater lagoon, the same as in summer dries out and becomes a salt mine. Between 1928 and 1930, a first exploitation of salt, it had no major accomplishments. Then in 1964 there was a new holding, the same as hard a time. 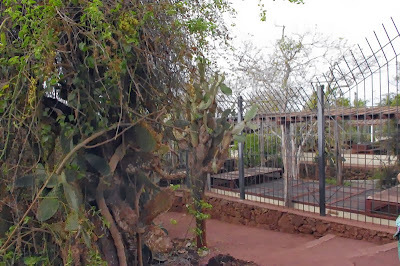 Puerto Egas, was named because of the last operation performed by Egas Héctor company, which failed because the price of salt in the continent was very cheap and did not justify exploitation in the Galapagos. The project was abandoned and left across their infrastructure. 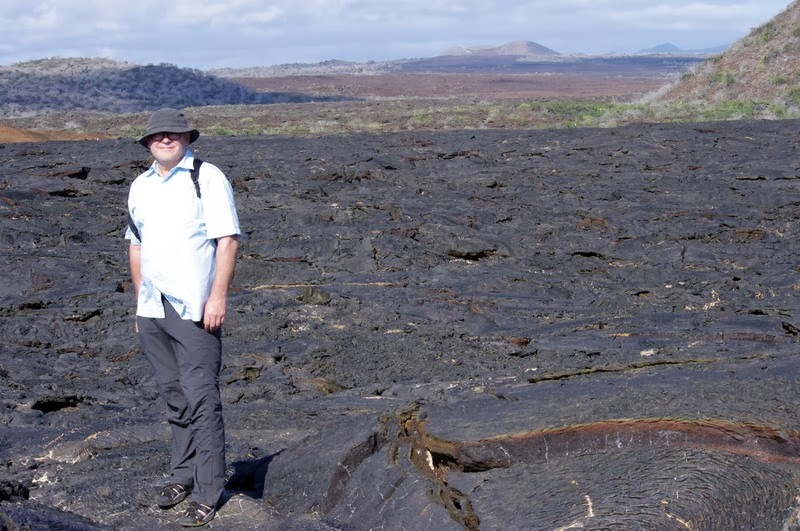 Tourists can take a walk along the coast on a lava flow of ash covered by coastal vegetation, which is usually hawks, doves land, lava lizards, finches, mockingbirds on the shore of the sea was especially low tide and about lots of crabs.